I made this card for Embellish Magazine's current challenge. I adore this mix of colours, and loved the challenge of mixing peach and pink. I must just add, that THIS digital paper kit is delicious. I see a new addiction coming on... (sorry in advance). Supplies: Paper - Vinnie Pearce, Stamp - PTI, Sticker - K&Co, Ribbon - Creative Impressions, Punch - Fiskars, Button - from stash. Oh, and if you've not yet seen it, Jennifer McGuire has just posted a FABULOUS Copic information sheet on her blog (click HERE to read it). Thank goodness - I've just ordered a stash of pens, and need HELP. It's my March mission. Some people asked me about the black stamping on THIS card - it's from THIS amazing PTI set. If you have nesties Labels 1, get it. It's wonderful. THIS stamp set never leaves my side. I take it with me to work and everything. :) I dream about it. Amazing card, Lucy and thanks for the link to Jennifer's site on the Copics. I don't own a single one and never knew the benefits of them until now. So thank you so much for sharing that! Gorgeous card Lucy....Love the softness...!! 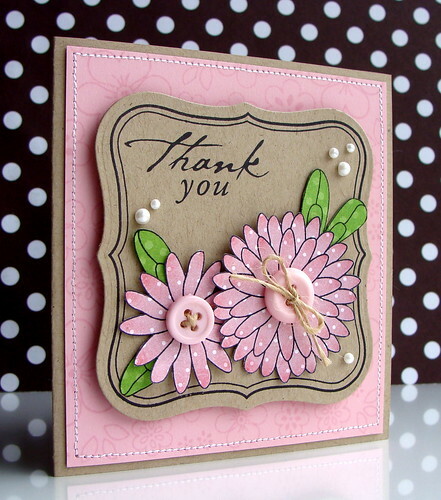 Gorgeous card with the lovely color combo, love it!! Such a yummy card Lucy! Gorgeous card Lucy and all those wonderful links... I'm locking the Credit card in a safe - otherwise it will get a thrashing!!!! Love how you used the colors! Good luck on your Copic adventure...I'm trying to hold off just a few more months! Such a great interpretation of this challenge! And so quick, wow! Thanks for all the links!!! Such a lovely card, the colors for this challenge look really delicious! THis is a lovely card...I also like your pink cat further down and your last 3 or 4 posts...great work....love your stuff!!! That card is another beauty, Lucy! I was so impressed with Jennifer's post on Copics that I ordered a whole mess too! I'll be thinking of you while I'm practicing with them. I just love your posts, Lucy, they are always so inspiring and I love all the links you provide. Thanks so much for being such a sweetheart! This is SO sweet! I love the scallops- what a great touch! Lucy... I have no words. So, so pretty. So glad you joined in on the Embellish challenge! Lucy, this card is simply awesome! sigh, it just makes me happy to see it! Wow...Gorgeous! Thank you for participating in the Embellish Color Challenge!